Phnom Penh Sorya Transport is one of the popular buses in the busy capital city of Cambodia that offers regular services to exciting destinations in the country. Sorya Transport is an express company in Phnom Penh that has been in the bus service industry for many years to provide enjoyable trips for travellers. Famously known for its ancient pagodas, unique temples and amazing historical sites, the exciting city of Phnom Penh is now a centre of attention that is frequently visited by both local and international tourists. Founded in 2006, Phnom Penh Sorya Transport has steadily grown their bus service in Cambodia by keeping their bus ticket price affordable. This company is run by a big team of 150 members, which compromises of 50 staff members, 70 professional drivers and 25 technical employees to handle the maintenance work for Phnom Penh Sorya Transport buses. Sorya Transport ensures that the safety of their passengers is well taken care of and enjoy their journey on the well-maintained Sorya buses. Phnom Penh Sorya Transport serves multiple routes from Phnom Penh to various cities within Cambodia with return trips too. This company serves daily departures with regular bus schedules to allow more flexibility for travellers to popular routes operated by the company from Phnom Penh towards the cities of Siem Reap and Kampot. Get around the magnificent cities in the country with the systematic bus timetables provided by Phnom Penh Sorya Transport. The travel duration between Phnom Penh to Siem Reap takes approximately five hours to arrive and four hours to Kampot. With a total of 37 vehicles, Phnom Penh Sorya Transport operates on single-deck buses of modern interior designs. Sorya Transport also runs on VIP sleeper buses for the night bus journey to multiple destinations to allow the passengers to have a relaxing trip especially during long-distance travels. The company’s buses are well-equipped with necessary facilities like the air conditioning, comfortable reclining seats and spacious legroom. 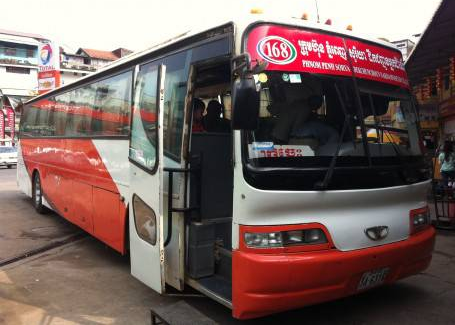 Phnom Penh Sorya Transport only hires well-trained and experienced drivers to operate its services for a pleasant trip. Book Affordable Bus Ticket with Easybook Now! Make the online booking for Phnom Penh Sorya Transport bus tickets through Easybook that also allows you to review the bus schedule and fares beforehand as well. The bus ticket prices for each booking vary depending on the bus routes selected. Book Sorya Transport bus ticket with Easybook for an unforgettable trip in Cambodia now!